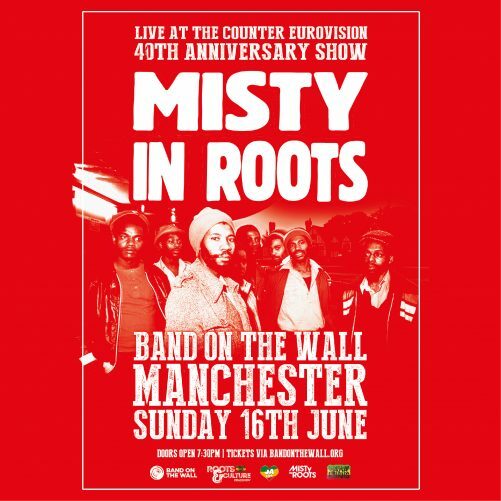 The seminal roots reggae band Misty in Roots return to Band on the Wall to celebrate the 40th anniversary of their debut LP, 1979’s ‘Live at the Counter Eurovision’. Fabled for their independence and integrity, the Misty collective can be compared to the mighty Musi-O-Tunya Falls they sing about on one of their most poignant tracks; the sheer drop of pounding water that can be seen and heard from both Zambia and Zimbabwe, that the British colonisers called after their Queen Victoria. Known in the local language as The Smoke That Thunders, its flow never falters, even if it’s obscured by mist. Misty In Roots is well grounded in its community, Southall in West London. Local musicians like singers Poko (Walford Tyson) and his brother Duxie (Delvin Tyson), both born in St Kitts, and Grenadan guitarist Chop Chop (Dennis Augustin) jammed together as teens, learning calypso and mento from the older West Indian musicians in the area’s pan-Caribbean mix; back then, Southall wasn’t as specifically Asian as it is now. Poko’s peers were the first kids from the old colonies to integrate the local schools, enduring all the schoolyard testing that implies. But as the complexion of the area began to change, the new arrivals from the former colonies created their own culture, in which school dances, youth clubs, and Caribbean Carnival festivities brought musicians together. Starting with a soft-spoken keyboard player, a Guyanan named Vernon Hunt, Misty gradually formed.